Sway is a web-based Microsoft Office tool that allows users to convey information as a newsletter, presentation, or document. Users can customize their Sway with headings, text, video, and images. Sways can be created from scratch, from a template, or from an existing file such as an outline created in Word. Content is then organized into sections called cards which can be easily dragged and dropped to reorder the information. Sway allows presenters, teachers, and students to visually organize the information they want to share and each Sway has its own link so that Sways can be shared easily on the web and through email or social media. Microsoft provides a good tutorial on its website; YouTube users have posted their own guides to using Sway; and the help feature is useful. However, it takes some playing around to get used to the tool. Since it’s a web-based app, the menus are different than standard Office menus. Learning to use the features to make your Sway go beyond a substitution for PowerPoint takes time. Microsoft’s privacy statement is robust and complete, but still fairly easy to read. Users can control how much data they provide, however, some data is required to make a tool like Sway work (email address, password). Data is shared with 3rd parties, but some settings can be adjusted. Microsoft is Privacy Shield compliant. Microsoft has an accessibility statement. 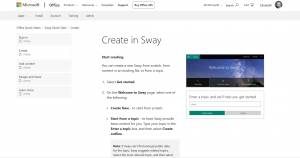 In Sway there are tips/best practices provided to make your Sway as accessible as possible. There is also an accessibility checker to review your work. Sway works with screen readers/narrators and can be used with just a keyboard (no mouse required). Sway can be used on all desktops and tablets and can be used without downloading any software or plugins. A highspeed connection isn’t required. Sways can be viewed on mobile phones, but editing on iphones isn’t possible and the Sway app for iOS is being discontinued. Substitution: Students create a Sway instead of a written book report. Augmentation: Students include photos, videos, and other graphics in their Sway to help classmates visualize the setting and time period of the book. Redefinition: The teacher can create a Sway linking all of the presentations together to create a gallery of reports. Students can also add editors to their projects to work on them together in real time. Far too often, technology is used as a direct substitute for other low-tech tools (e.g., pencil and paper). While substitution has some benefits (e.g., students develop their technology skills and knowledge), we encourage you to think about how you might use Sway to modify or redefine learning. 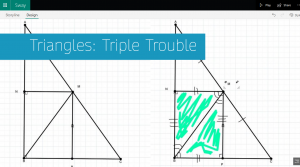 Students make a Sway that includes a video explanation of the different type of triangles and include a gallery of images showing where the triangles occur in their environment or everyday life. Students contribute articles to a classwide newsletter displayed on Sway. Students practice technical writing by creating a user manual for their favorite kitchen appliance and publish the manual on Sway as a documentation. Art teachers could use Sway to create a gallery of their students’ work for a particular unit and then share the gallery with students in different classes, grades, or schools in the same district. Khazanchi, R. & Khazanchi, P. (2018). “Use of Microsoft SWAY in making Engaging Digital Stories for Students with Disabilities in K-12 classrooms”. In E. Langran & J. Borup (Eds. ), Proceedings of Society for Information Technology & Teacher Education International Conference (pp. 2436-2441). Washington, D.C., United States: Association for the Advancement of Computing in Education (AACE). Retrieved November 5, 2018 from https://www.learntechlib.org/primary/p/183618/.